Give your dog a quick makeover. Guest columnist Wendy Nan Rees shares her thirty-minute dog makeover grooming routine. In less than half and hour, your dog can be bathed and dried and have its teeth brushed and eyes and ears cleaned. Little Man and Cappy are talking, and I overhear Cappy telling Little Man just how lucky he is because he has short hair and never has anything to worry about other than clipping his nails, brushing his teeth and getting his ears and eyes cleaned on a daily basis. Cappy says, "I have this styling puppy cut, but no matter what, I still have to deal with my mats and tangles. I just can't do a thing with my hair anymore. I tell you, when I was young, it was just wash and go. Everything was just so easy when I was just a wee one!" What is so funny is, the same thing is true for people. Can you remember when you were young? I bet your hair was never a problem and if it was, you probably didn't care. As you got older, it became harder to deal with. If you show your dog or you are a model, your hair matters all the more! Dogs age; we age. It is really kind of funny when you think of it that way. This brings me to this week's tip. There are so many makeover shows on TV these days. We make over our homes, our cars, our talents and yes, our pets! So this is my version of the Thirty-Minute Makeover that I call Summertime Glow. Your dog is having a bad hair day. He has long hair and it is matted, scraggly and feeling all-around yucky. He isn't nearly as confident when he strolls down the street for daily walks; usually he struts around your block like it is his personal red carpet. His nails scratch on the kitchen floor when he walks across it. You blame his favorite chicken broth-soaked rawhides for his offensive breath, but the truth is that you have been slacking on his oral hygiene. You can clean up your dog's act in about 30 minutes, and restore his king-like confidence. Maintenance in between grooming appointments will keep him healthy as well. Clean fur carries fewer allergens and is softer to touch. Some dogs actually welcome the cleaning, knowing their reward will be more lap time. Follow this regimen for a quick makeover that will please you both. Shampoo and condition - Wash smaller dogs in the kitchen sink if you have a handy spray attachment. Medium and large dogs must be bathed in the family bathtub or laundry tub. Always use lukewarm water so you don't burn your dog or dry out his skin. Test water temperature on the inside of your arm before soaking your dog. Towel off and blow dry - Absorb excess water from your dog's coat with a bath towel or chamois. 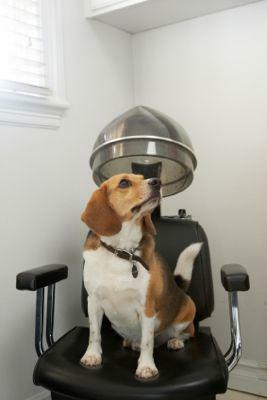 Long-haired dogs can benefit from a "blow out" with a special dog hair dryer that comes with its own stand. This tool speeds the drying process and allows you to simultaneously remove tangles with a comb. Brush teeth - Using a dog toothbrush and toothpaste, give your dog's pearly whites a good cleaning. You can find varieties of toothpaste flavored like peppermint, beef and chicken. Clean ears and eyes - Squeaky clean ears and bright eyes are signs of a healthy dog. You can purchase prepackaged, presoaked ear pads and wipes for convenience. Cleaning solutions also come in gels and liquids that you dispense and massage into the ear. Eye wipe pads also make the job of cleaning the "sleepers" that collect in the corner of your dog's peepers. You may also use drops. Check with your vet for recommended eye and ear solutions. Short-haired dog owners get off easy. A quick rinse, shampoo and shake-off later, their dogs are "groomed." Long-haired dogs require more maintenance, and because their fur tangles easily and takes longer to dry, you may opt to use a doggy hair dryer to speed the process. Never use a human hair dryer on your dog. The only exception would be to use your own blow dryer on a cool setting and constantly move it back and forth, dispersing the air along the dog's body. Ideally, purchase a special blow dryer tool from a catalog or pet store. Dog blow dryers are safe, effective and specially designed to not burn your dog or dry out his skin.